Kirk Stover lives in Minnesota, where he is a systems analyst for an insurance company. He has worked with computers for about six years, yet remains intrigued by them. If you spend more time working on your computer than watching television, you may be missing out on a new social phenomenon—the Wheel of Fortune craze. Well, fear no more! America's favorite game show is now playing on your Atari 520ST. With Mouse of Fortune you too can feel the suspense of buying a vowel, and know the thrill of solving a puzzle. Mouse of Fortune may also serve to lure to your side that anti-computer spouse, parent or sibling who's been giving you a bad time. To begin, double-click on MFORTUNE.PRG. This will bring up the title screen and an alert box with three options: File, Create and Program. This is how you determine the source of the puzzles for your current game. 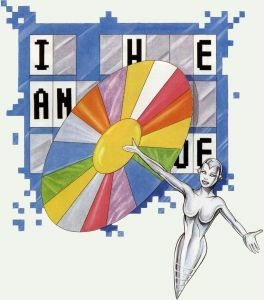 The outlined choice, Program, will use the 100 puzzles that are built into the program, and the game will begin immediately. For variety, you'll probably find that you want more puzzles to choose from. For this reason, you have the ability to build your own puzzle files by clicking on the option Create. This will bring up a file selector box where you're required to name your new puzzle file. You must choose a new name that does not already exist. After naming the file, you will be presented with a screen which will ask for each topic and its corresponding puzzle individually. The topic can contain ten alpha and space characters, and the puzzle itself can contain 26 alpha and space characters. Any topics or puzzles you input which do not meet these criteria will not be accepted into the file. You then repeat this process for as many puzzles as you can think of, with a maximum of 100 per file. To end the create mode, type in END when asked for the next topic. Your new puzzle file will be saved to disk, and you'll be returned to the title screen. To load one of your own puzzle files, click on the File option and specify, when prompted, the puzzle file desired. Now you're ready to play Mouse of Fortune with either the program's puzzles or your own. When the game starts, the screen will display the randomly selected topic at the top, with the blanked out puzzle below it. It's a two-player game, and the blue "mouse of fortune" will indicate whose turn it is. Players are presented with three choices: Choose Letter, Buy a Vowel and Solve Puzzle. There's a beeping clock which gives you ten seconds to make your choice. If you run out of time, you lose your turn. When you opt for Choose Letter, a random dollar amount that the letter will be worth will be displayed. As well as getting a letter amount, you may also get "Lose a Turn" or "Bankrupt." If you hit bankrupt, you lose all the money you have accrued so far, and the other player gets the turn. As long as you get a dollar amount, a letter board will be displayed for you to choose from. Just click on the letter you want to try for. If the letter you've chosen is in the puzzle, all occurrences of it will be turned over, and you'll receive the dollar amount it is worth multiplied by how many times it appears. If you choose a letter that is not in the puzzle, you lose your turn. Watch the blue mouse-of-fortune. It always knows whose turn it is. Once a letter has been chosen, it will be blanked out on the letter board. In order to buy a vowel, you must have at least $250. Once you click on that option all available vowels will be displayed and $250 will be deducted from your account. If you buy a vowel that's not in the puzzle, you lose your turn. Players continue to choose letters and buy Vowels until someone thinks they have the puzzle solved. When you feel you know, click on Solve Puzzle. This will give a prompt at which you type in what you think the solution is. It must match exactly, or you'll lose your turn. You can pause the game at any time by pressing any key, and resume play in the same manner. You can end the game at any time by pausing the game and pressing the escape key. Whoever solves the puzzle correctly has their score from that round rolled over into their game total. The losing player receives no money for that round. There are three rounds in a game, and whichever player accumulates the largest dollar amount over the three rounds is the winner.